I've been quite surprised at the fuss the English are making over what nationality their next manager should be. It has recently emerged that Football Association chief executive Brian Barwick has been in Portugal discussing terms with Luiz Felipe Scolari (pictured left) whose contract with the Portguese national team ends after the World Cup. Scolari's pedigree as a coach is excellent. In 2002 he led Brazil to victory in the World Cup in Korea and Japan and in 2004, he led Portugal to the Euro 2004 final where they were just beaten by Greece. He is also known for taking a tough stance with big stars and famously substituted Portugal star Luis Figo during the Euro 2004 tournament when he was underperforming against England - a move that helped Portugal advance in the tournament. In contrast current England coach Sven Goran-Eriksson has been accused of favouring certain players such as David Beckham. "No matter how brilliant a coach someone from abroad may be, it is a betrayal of Englishmen and England fans. "I said from the outset that in my opinion it should go to an Englishman. "I have done my pro license like Sam Allardyce, Alan Curbishley and Steve McClaren. "I would like to have seen one of the England lads get it. "There are some great young managers in this country who could do the job no problem." - Portsmouth manager Harry Redknapp. "I would personally like to see Martin O'Neill appointed. "I'm quite surprised there could be another foreign manager after Eriksson. "It's sad to see they've gone abroad for a manager when England taught the rest of the world how to play the game." Martin O'Neill himself of course is foreign being an Irishman, but I digress. The above comments display how English people are allowing blind patriotism take precedence over a proven winner. Why do these people whinge so much? 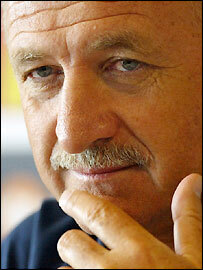 The way I see it the English would be very lucky to get Mr Scolari as their manager. The nationality of the man is irrelevant. 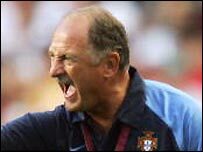 You get the best man for the job and right now none of the English contenders have anywhere near the level of experience that Scolari possesses. With that being said, I can't imagine why any man would want to take on this job anyway as it means having your private life left to the mercy of perhaps the most vicious media in Europe, if not the world! Add to that the fan expectation which is always sky high and it makes for a head-wrecking job altogether. I wouldn't take the job regardless of how much money they threw at me. It will be interesting to see if Scolari does accept the offer and what the English reaction will be if that happens. Update: Scolari has turned down the opportunity. Can't say I blame him.